For our monthly no-stress just-for-fun Paper Pros challenge, the theme was set by Sandy Diller as Spring Fever. I've been teaching a lot for the last several months and have been unable to participate in the challenges, but I lucked out this month because one of my class projects for Friday fits the theme! This Friday I'll be at Kaitlyn's Crop 2019 Spring Fling teaching a 2-card class. The class kits will also include a die. In addition, students may shop our entire line at the Scrapp'n Savvy mobile store at the crop. The first card features the Woven Basket Box Card die set and also incorporates decorator dies (bird, frame, heart) from the Frame Pull Pop-up. The borders and twigs come from our Border Blends - Party die set. The other class card is a Rockin' Rectangle Pop-up birthday card, featuring the ostrich from Feathered Animals. It also uses decorator dies from the Cupcake Pop-up, Rectangles - Crosshatch and Birthday Charms. All your favorite adhesives including liquid glue with a fine tip, tape runner, double-sided tape (0.25" is best), miniature glue dots, pop-dots. 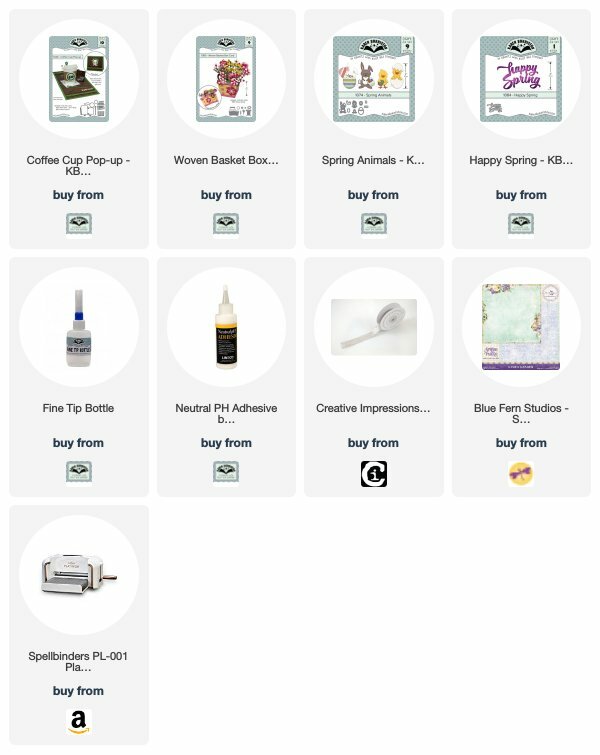 If you're not taking the class but would like to check out the rest of the Paper Pros projects, you'll find the links in the left sidebar under Design Team and Paper Pros. This die does differ from our Flower Pot Pop-up die set. The Flower Pot is smaller and is designed to be installed inside a card. The Woven Basket is meant to be a standalone card that you flatten and mail. However, if you own both sets, you'll be able to mix and match the decorator pieces (flowers & vines) between the two sets and they do not duplicate. This card uses our new Happy Spring script die for the greeting. As always, you choose your colors, styling and theme. Our script word dies work really well with the basket, either suspended in the bouquet or attached to the front. If you want to add a place to sign the card, simply add a shape to the back panel or tie a tag to the handle. For this masculine version, I didn't use the flowers or vines that come in the set and instead turned to the Outdoor Scene, the decorator trees from the Evergreen Pivot Panels, and our Camping Charms. The greeting is from Word Set 2 - Birthday. The Woven Basket Box Card flattens for mailing (I recommend an A7 envelope) and then becomes a beautiful display piece. It's so versatile - you can fill the basket with anything, for any season, any theme.